If bees disappear, they could take most of our insect pollinated plants with them, potentially reducing humankind to little more than a water diet. Local citizens, farmers, small and large businesses as well as beekeepers are trying to protect bee populations throughout the world. 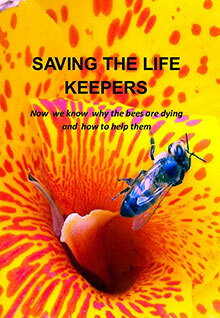 Bees are under-appreciated workers who pollinate 80% of our flowering crops which constitute 1/3 of everything we eat. This documentary reveals how we can help protect and preserve bee populations utilizing the biodiversity of plants, mass plantings of protein rich flowers, Queen bee organic mating yards, fighting bee parasites and diseases without chemicals and antibiotics, and how to work with productive and resistant Africanized bees.